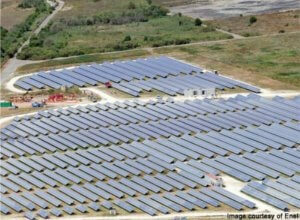 The Montalto di Castro Photovoltaic Power Station in Italy is one location where solar electricity is already as cheap an investment as traditional fossil fuel sources. In the world of renewable energy resources, solar power is the epitome – abundant, reliable, and green. For decades scientists and engineers have been working tirelessly to improve the efficiency at which photovoltaic cells convert sunlight to electricity. If they can simply make PV cells efficient enough, then they would be cheaper than fossil fuels and most of the world could switch over to the better technology. Getting solar power to be as cost-effective as traditional electricity sources is known as reaching “grid parity”, and several locations around the world have already succeeded in making it a reality. How can the rest of the world join in? While scientists and engineers will be crucial in that development, loan officers and bankers may hold the key to bringing solar power to the masses. Researchers at Queen’s University in Canada have compiled a comprehensive study of solar power plants and found that improvements in financing, and industrial streamlining could allow for the technology to become as cost-effective as traditional electrical sources. In other words, a much larger part of the globe could currently reach grid parity if cheap loans and better supply chains were available. The study was led by Joshua Pearce, along with K. Branker and M.J.M. Pathak of Queen’s University. It found that variations in financing interest rates could alter the cost per kilowatt-hour by ten cents (Canadian) for typical solar plant configurations. Considering that the retail cost of electricity in Canada is just around ten cents, this financial-dependence is a large consideration for building new solar power plants. Pearce and his colleagues also found that many previous studies were too conservative in their evaluations of photovoltaic cells. Most analysts assume solar cells will lose 1% in peak output every year, but PV systems from the 1980s showed considerably less loss in the past two to three decades. The Queen’s University team found 0.5% loss to be a better estimate and typical losses might be expected to be 0.2 to 0.5%. As such losses compound every year, that small difference in calculation can lead to big changes in the projected cost-effectiveness of a solar power plant. In other words, such plants are much better investments than they’ve previously been thought. Especially when one considers that most other levelized cost of electricity (LCOE) evaluations peg solar cells at having effective lifespans of 20 years, when Peace and colleagues found 30 years to be a better estimate. As even older technologies from the 80s are going longer and stronger than most analysts assumed, the return on investment for building solar plants is higher than generally accepted. Which means many more solar power plants could reach grid parity with current levels of technology. As the Queen’s University team pointed out, British Petroleum test systems in California and Hawaii have already succeeded in reaching grid parity. They are not alone in that success. 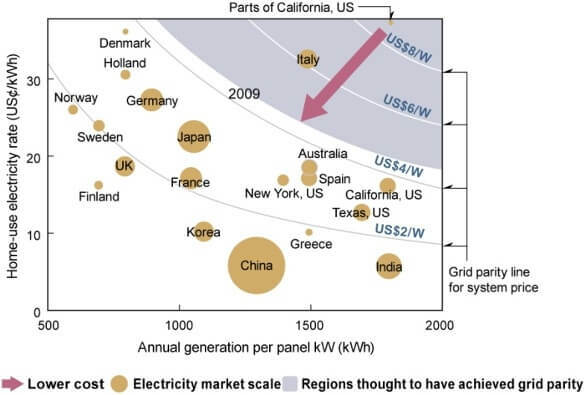 Nikkei Electronics Asia declared Italy had reached grid parity last year. The Montalto di Castro Photovoltaic Power Station competes with traditional sources in the nation. In fact, Italy’s solar industry has grown remarkably in the past three years, up to one gigawatt of produced power. Nikkei and other industry analysts believe Southern Europe is primed for solar grid parity. The rest of the world is quickly catching up. In the past decade, total solar power production has increased from less than 1 GW to around 16 GW. Since 2008, the cost of photovoltaic modules has dropped by a remarkable 60%! This exponential growth in total global solar electricity output lines up well with the projections of futurist Ray Kurzweil. His much discussed predictions say that the world will continue to double solar power production every two years. In 20 years the world would produce around 15,000 GW – the total amount of energy humanity consumes in all forms. 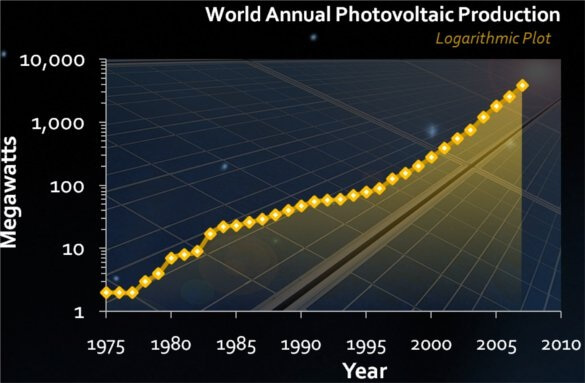 Ray Kurzweil's logarithmic graph for solar power production shows a clear growth that, if continued, will have solar providing enough electricity to power the world in just 20 years. A world almost completely powered by the sun in just two decades seems like science fiction, but the work of Pearce and his colleagues seemingly corroborates some of Kurzweil’s predictions, at least in the near term. Current investments in solar power are not as large as they could be, not because of a lack of government mandates, nor because photovoltaic efficiency isn’t increasing quickly enough. Instead high interest rates in loans, overly conservative estimates on return in investments, and preferences for short term returns in energy markets have undervalued solar power plants. In 2010 new investments in solar power were only around $26 billion (USD), about one-fourth of that put into wind. While solar grid parity hasn’t been reached universally, it has been well documented in a few locations. If Pearce’s LCOE study was to be applied, it’s likely that many more such locations would be found to already be cost-effective for photovoltaic cells. Improving the solar cell industry to take advantage of economies of scale, more efficient supply lines, and more experience in installation/maintenance will only increase the number of solar-ready locations. And, of course, the biggest factor, the actual quality of the photovoltaic technology is only going to keep improving. At 8% efficiency the entire world could obtain all the electricity it needs from solar cells covering land equivalent to the size of Colorado (~ 100,000 square miles). Some of the most recent, and experimental, PV cells have surpassed 40% efficiency. The current solar industry is small, providing just one-thousandth the electricity consumed by humanity. Yet with the right investments, that fraction is ready to grow exponentially in the years ahead. Solar grid parity is already here for some of us, and it’s much nearer than the rest of us may believe.